Bottlenose dolphins are arguably the best known of all cetaceans; familiar to everyone thanks to the TV star "Flipper". The species has a robust appearance with a stocky snout distinctly set off from its forehead by a crease, which gives the animal its common name. It is usually slate grey or charcoal in colour, with a paler underbelly. Males can reach up to 3.8 m in length and 600 kg in weight. The dorsal fin is tall and curved. They usually live in small groups in inshore habitats but may also be encountered offshore in groups of hundreds of individuals. Some bottlenose dolphins have been known to live solitary lives and to approach humans from time to time, such as “Fungie” in Western Ireland. Bottlenose dolphins are very active swimmers. Tail slapping, leaping and aerial performances are often part of their natural behaviour. They prefer feeding on fish and molluscs, but their diet can be highly varied. They use echolocation for foraging like all toothed whale species. Bottlenose dolphins are regarded as the most cosmopolitan of all dolphins. They are found in all temperate a nd tropical marine waters of the world. A few resident populations exist around the British Isles and used to be indigenous off the Dutch coast. 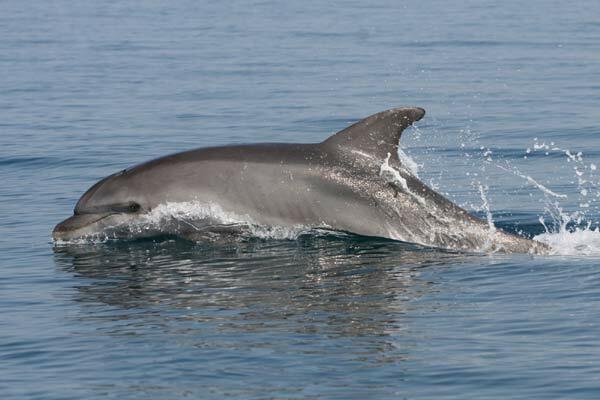 A group of more than 100 individuals, which is permanently resident in the Moray Firth near Inverness and Cromarty in Scotland, is the northernmost bottlenose dolphin population worldwide. According to SCANS II about 2000 individuals inhabit the ASCOBANS area. As an often coastal and very popular and intelligent species, bottlenose dolphins face a number of human-induced threats. These include direct catches and kills, live captures, bycatch in gillnets, driftnets, purse seines, trawls, long-lines, and on hook-and-line gear used in commercial and recreational fisheries, overfishing and the resulting prey depletion, marine pollution, underwater noise and tourism. Northern East Atlantic Fair 19,295 (CODA), 12,645 (SCANS)* Project Report: Review of Trend Analyses in the AS [more] The population size estimate is based on data collected during SCANS-II (2005) and CODA (2007) surveys. See the previous Trend Analysis document for more details. SCAN-II and CODA reports can be found in the additional notes section. *Note: the estimated population sizes are for the entire CODA and SCAN-II survey areas and not just for the Northern East Atlantic. The separate estimate for this region is not available. Central Eastern Atlantic Fair 19,295 (CODA), 12,645 (SCANS)* Project Report: Review of Trend Analyses in the AS [more] The population size estimate is based on data collected during SCANS-II (2005) and CODA (2007) surveys. See the previous Trend Analysis document for more details. SCAN-II and CODA reports can be found in the additional notes section. *Note: the estimated population sizes are for the entire CODA and SCAN-II survey areas and not just for the Central East Atlantic. The separate estimate for this region is not available. Bay of Biscay Fair 19,295 (CODA), 12,645 (SCANS)* Project Report: Review of Trend Analyses in the AS [more] The population size estimate is based on data collected during SCANS-II (2005) and CODA (2007) surveys. See the previous Trend Analysis document for more details. SCAN-II and CODA reports can be found in the additional notes section. *Note: the estimated population sizes are for the entire CODA and SCAN-II survey areas and not just for the Bay of Biscay. The separate estimate for this region is not available. Northern North Sea Fair 19,295 (CODA), 12,645 (SCANS)* Project Report: Review of Trend Analyses in the AS [more] The population size estimate is based on data collected during SCANS-II (2005) and CODA (2007) surveys. See the previous Trend Analysis document for more details. SCAN-II and CODA reports can be found in the additional notes section. *Note: the estimated population sizes are for the entire CODA and SCAN-II survey areas and not just for the Bay of Biscay. The separate estimate for this region is not available. English Channel Fair 19,295 (CODA), 12,645 (SCANS)* Project Report: Review of Trend Analyses in the AS [more] The population size estimate is based on data collected during SCANS-II (2005) and CODA (2007) surveys. See the previous Trend Analysis document for more details. SCAN-II and CODA reports can be found in the additional notes section. *Note: the estimated population sizes are for the entire CODA and SCAN-II survey areas and not just for the English Channel. The separate estimate for this region is not available. Irish Sea Fair 19,295 (CODA), 12,645 (SCANS)* Project Report: Review of Trend Analyses in the AS [more] The population size estimate is based on data collected during SCANS-II (2005) and CODA (2007) surveys. See the previous Trend Analysis document for more details. SCAN-II and CODA reports can be found in the additional notes section. *Note: the estimated population sizes are for the entire CODA and SCAN-II survey areas and not just for the Irish Sea. The separate estimate for this region is not available.